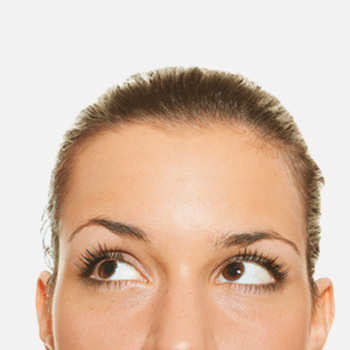 When the first tiny transverse forehead folds don’t seem to go away again, when your eyelids are getting heavier and crow’s feet start to show, all these are signs for the beginning of the aging process. Your face looks a little tired, your glance a little sad. The usual harmony and function of the upper third of your face seems to be slightly disturbed. Since the eyebrows seem to fall down the patient tries to unconsciously lift them up, which is the first condition for the development of transverse folds on the forehead and an overstretching of the muscles underneath (see also migraine). A lifting of the forehead re-establishes the dynamic of the upper third of your face. There are two options: endoscopic surgery bears the advantage that the main focus lays on hiding the incisions, practically making them as invisible as possible. Tiny little cuts placed directly in the hairy part lift the eyebrow and at the same time weaken the musculature between the eyes. Mimic folds, especially those manifested through constant anger are smoothened. An advanced aging process with flagging skin and deep furrows rather calls for a classical forehead lift. Corresponding skin cuts are also placed directly in the hairline. Due to our yearlong experience we are able to make „invisible scars“, even when a loss of hair in this area is recognizable or the patient wishes to change his/her haircut into short hair, the scars will be hard to see. The surgery is carried out under general anesthesia or twilight sleep; the in-patient period is 1 day. In general swellings will go away within 1 week. After 3 days you can even wash your hair again.